Eltra Engineering BV specializes in industrial IT & automation systems. The company’s focus is on IT systems for food and process industry as well as automation systems for machinery. Eltra designs, develops, deploys and maintains these systems. Three experts joined in action and founded Eltra in 1997. Success was based on a simple business plan: make quality the primary objective, not growth. The industrial sector demands fast, targeted action and this requires short lines of communication. Eltra realizes that objective by investing in specialists who understand the customer’s business and requirements. In addition staff are trained and provided with support services. This results in a team of specialists who carry out projects successfully and who are able to implement maintenance programs. 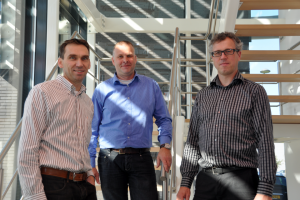 Eltra’s founders — Rob Pals, Erik Schalk and Henk Klijn — work as project managers and they are always available. Therefore the lines of communication could not be shorter.